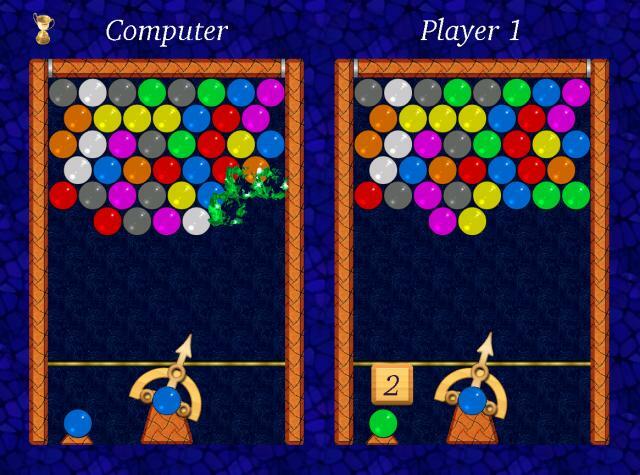 XBubble is a Puzzle Bobble clone for Unix/X11 platforms. It was written in C from scratch with no intent to exactly reproduce the original game. It is distributed under the GNU GPL license. Each player rotates a canon and fires a colored bubble that gets stuck to another bubble. When you stick three or more adjacent bubbles of the same color they all explode, and any bubble left hanging free falls down. Periodically, all bubbles are lowered by one row. The goal is to clear all bubbles from your board and avoid bubbles dropping below the line at the bottom of the screen. In single player mode, the ceiling goes down every time bubbles are lowered. In multi-player mode, the ceiling does not move but a fresh row of bubbles is added on top of the board. Each time you make bubbles drop, or if more than 3 bubbles explode, these are sent (with different colors) to your opponent. You win the round when your opponent loses ! Single/Multi-player/versus Computer modes. You can play alone or against an opponent. You can also practice against the computer, with 5 levels of difficulty, from "Very Easy" ( a dumb opponent ), to "Very Hard" ( not so dumb an opponent ! ). Fully scalable and customizable graphics. XBubble automagically adjusts its window size to fit your screen size, but you can actually pick any size you like. You can also easily provide your own sprite graphics.